Rather than hanging Jovan Belcher's jersey inside his locker as an awkward tribute and having a moment of silence for domestic violence victims before Sunday's game, the Kansas City Chiefs should have handed out this fact sheet from the National Coalition Against Domestic Violence to every player and all the fans who attended the game. By hanging Belcher's jersey, the Chiefs created a memorial for a man who murdered the 22-year-old mother of his infant daughter on Saturday morning, then drove to the team's practice facility and fired a single shot into his head in front of coach Romeo Crennel and general manager Scott Pioli. The moment of silence for domestic violence victims at Arrowhead Stadium was sadly fitting, because when it comes to acknowledging violence against women, the sports world is often mute. If you glance at that domestic violence fact sheet, then you'll understand that Kasandra Perkins' murder isn't unusual at all. Many people are shocked because this tragic story involves an NFL player, but according to the National Coalition Against Domestic Violence, nearly one-third of female homicide victims are killed by an intimate partner, and in most cases, authorities discover that the abuse began long before a fatal crime occurred. 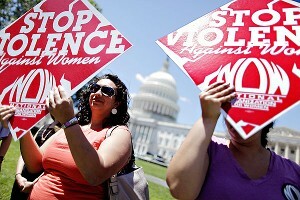 Multiple organizations demonstrated in June, calling for Congress to reauthorize legal protections detailed in the Violence Against Women Act. At this point, we don't know the state of Perkins and Belcher's relationship. Some friends have described them as a happy couple and others say their relationship was in trouble and Perkins had expressed concerns about Belcher's mental health to friends. As of now, it does not appear Belcher had any history of domestic abuse. Regardless of whether we ever learn the full story behind what led to this unspeakable tragedy, violence against women is a significant problem in our society. In sports, it's sometimes met with indifference until something like this happens. When O.J. Simpson was accused of murdering his ex-wife Nicole, it put domestic violence in the spotlight for a moment. Same with Rae Carruth, who is in prison for arranging the murder of his pregnant girlfriend. The same public scrutiny undoubtedly will happen with Belcher, so while the window is open, there needs to be a serious conversation about the broader issue of violence toward women, especially by athletes. Many people are struggling to comprehend how Belcher -- who while attending Maine was a member of Male Athletes Against Violence -- could have done something so horrible. People keep searching for provocation, as if a scenario existed that could have warranted Belcher shooting Perkins multiple times in front of her 3-month-old and Belcher's mother. Maybe it wasn't just one thing that contributed to this tragedy. Although Chiefs owner Clark Hunt told reporters on Sunday the medical staff confirmed that Belcher didn't have any unusual medical issues, with all that's known about the damage repeated on-field collisions can do to the brain, I'm willing to consider the fact that those collisions may have taken a toll on Belcher's mental health. But there also is room for a deeper discussion about how sports deals with domestic violence, and to address why it seems athletic culture has made disrespecting and hurting women acceptable. "We start trying to have this real complicated conversation, and in the sports world, we don't want to have that conversation," said Don McPherson, a former NFL quarterback who has dedicated his post-football life to traveling across the country to speak about gender issues. "This will become about mental illness, gun control and the pressure of the NFL, when it's men." There is no evidence that definitely proves playing sports makes athletes more prone to violence toward women than the rest of the population. But there are some statistics that do highlight some alarming trends involving male athletes. In 2010, Jeff Benedict, an English professor at Southern Virginia University who has written extensively about athletes and crime, released a thorough examination of arrests for professional and college athletes during a sixth-month span. There were 125 athletes arrested during that period, including 70 college football players. Domestic violence cases accounted for nearly 20 percent of the total. Even more disturbing than some of the crimes committed was how some athletes were punished. At Oregon, LaMichael James was charged with menacing, attempting strangulation and assault after an altercation with a former girlfriend. The case eventually was resolved with James pleading guilty to a misdemeanor harassment charge. He was suspended only one game, and although he was sentenced to 10 days in jail, he never did any jail time. If some cases are being handled like that, we can't be surprised if violence toward women continues to escalate, or the fact that so much of the violence goes unreported. And even if you believe violent crimes committed by athletes aren't more of an issue than those committed by the general population, there is research that shows the conviction rate for athletes is drastically different. The National Coalition Against Violent Athletes cites a 1995 study that found that people in the general population accused of assault were convicted 80 percent of the time while athletes facing similar charges were only convicted 38 percent of the time. Two years ago, Virginia men's lacrosse player George Huguely murdered his ex-girlfriend Yeardley Love, a member of the Cavaliers' women's squad, just weeks before her graduation. Huguely, who was eventually sentenced to 23 years in prison, had a history of violence and had threatened Love because he was upset their relationship ended. It also raises questions about how violence against women is marginalized by the legal system and how some coaches, based on the weak punishments, desensitize athletes to the issue. Cases similar to that of James or Chris Rainey -- a former Florida running back who was initially charged with aggravated stalking after texting a former girlfriend "time to die" in 2010 but later pleaded guilty to a misdemeanor -- make you question what kind of message women are being sent about the value of their lives. Sports is supposed to teach men the proper values -- leadership, teamwork and accountability -- but locker rooms also sometimes promote a twisted sense of masculinity and pander to jock culture that is firmly rooted in being anti-woman. McPherson, a member of the College Football Hall of Fame who works tirelessly with male athletes about rejecting this culture, believes the NFL isn't in a position to seriously confront violence toward women -- even though the league addresses domestic violence at its annual rookie symposium, has strengthened its personal conduct policy and recently had quarterback Eli Manning appear in a White House public service campaign with other athletes to raise awareness of domestic violence. Domestic violence advocates circulated an Internet petition in an effort to convince the NFL to have players wear blue to honor Domestic Violence Awareness Month in October -- which also is Breast Cancer Awareness Month. The NFL chose to support Breast Cancer Awareness only, something the league has done for years. Next October, NFL players should be wearing pink and blue. It shouldn't take another tragedy for the sports world to realize it has a responsibility to promote healthier attitudes toward women or for it to make stemming violence toward women a high priority. Because silence won't accomplish anything.